The universe has long captivated human imagination, but it wasn’t until actual images were being made that space travel became a reality in human perception. What follows is a list containing 10 of NASA’s most groundbreaking pictures that stand as testaments to our interstellar achievements and aspirations. As the fourth picture of Earth to be considered one of NASA’s greatest ever photos, Earthrise was taken during the Apollo 8 mission, 1968. The endeavor was a groundbreaking event that set the tone for mankind’s eventual landing on the moon. This image was taken while the crew of the Apollo orbited the moon during Christmas time. Their public broadcast on Christmas Eve was the highest viewed television program at the time. The mission was meticulously documented, including the audio track of when the “Earthrise” picture was taken. Listening to the audio while looking at the picture provides a clear imprint of the awe these guys felt when documenting this event. As you listen, try to wipe clean the desensitized characteristic of a generation diluted by pop culture and cookie cutter music. Back when “Earthrise” was taken, people still knew how to dream. Like the original “Blue Marble” picture, “Earthrise” inspired environmental activists to fight for preservation of a vulnerable Earth. Like any great movie, “The Blue Marble” picture received its long-overdue remake forty years later. Even though the official image shows the Americas (can you blame them? ), NASA was a good sport and released a sister photo of the eastern hemisphere. The difference between this picture and its predecessor is that “The Blue Marble 2012” is a composite image. What you see before you is the ultimate result of compiling data from the Suomi NPP (Suomi National Polar-orbiting Partnership) satellite. The data used for the image was a result of six full orbits of the earth and stands as one of the best quality images of Earth to this date—a feat worthy of its predecessor. I promise this list is not the “Top Ten Pictures of Earth”, and that this will be the final “marble” picture to be featured. Like “The Blue Marble 2012”, “The Black Marble” was taken from the Suomi NPP satellite. This set of photos showed, in great detail, all of the lighting visible to the space at night. Go figure that most of it was man-made. These images serve as a stark reminder of mankind’s growing presence on the Earth. The process to produce this image was both laboriously and technically intensive. Once mastered, the techniques behind this photo have led to a variety of different photos of the Earth at night. One of the more famous variants of this night time photography of the earth was taken during Hurricane Sandy. Throughout the space exploring years, NASA’s most consistent and vital utility (without a doubt) has been the Hubble Space Telescope (HST). HST should be featured on a credit card commercial documenting how much it cost (well over a billion dollars during its seven year manufacturing) to put in the air versus the pricelessness of its production. This highly sophisticated image taker has been orbiting Earth since 1990, and has returned to us some incredible photos—particularly of deep space. 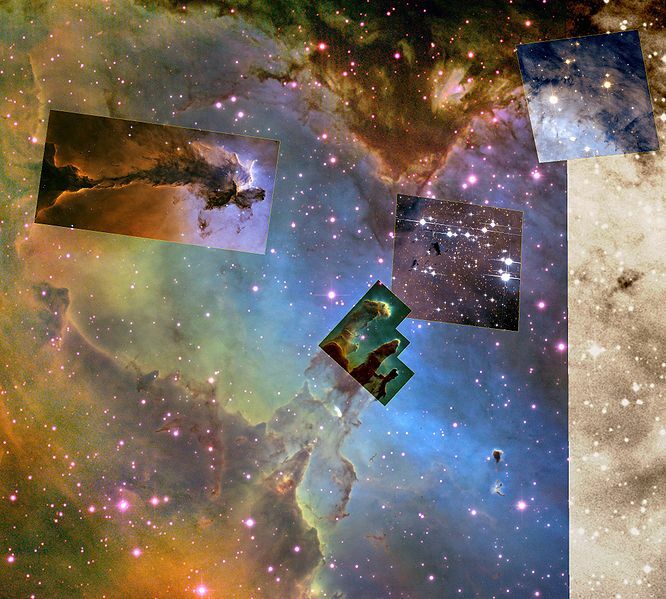 “The Pillars of Creation” is one of these priceless pictures that feature elephant trunks, or distinct columns of interstellar matter and gas an estimated 7,000 light years from Earth. Click here to view the Pillars’ place in the Eagle Nebula which houses an impressive array of relatively young stars. All of the Eagle Nebula’s stars were generated from the same giant molecular cloud near the same time. Pictures like this one remind us that we share the Milky Way Galaxy, let alone the entire universe, with a vast menagerie of spectacles and wonderments.